After E3 we were contacted by Nintendo and we're talking to them about the possibility of releasing Armikrog on the Wii U. There's nothing concrete to report yet, but we're encouraged by their interest and we'd like to see it happen. 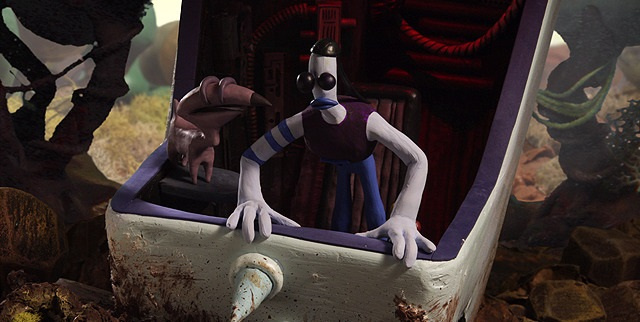 The development of Armikrog is being helmed by Doug TenNapel, who created characters like Earthworm Jim and the critically acclaimed adventure The Neverhood. The new title appears to be a traditional point and click adventure and will feature the voices of many established actors, such as Napoleon Dynamite's Jon Heder. There are five days left for the game's Kickstarter campaign and they have quite a ways to go before hitting their goal, so if this looks like something you're interested in, check it out. Armikrog is currently only down for a PC, Mac and Linux release, but it appears the studio is open to the idea of bringing it to consoles. You can check out the game in the video below. What do you think of Armikrog? How do you feel about Nintendo reaching out to indie developers running Kickstarter campaigns? Let us know in the comment section. The more games the merrier! I feel sorry for them--It looks like they're not gonna make it. YES YES PLEASE YES. I'm extremely excited for this game. I know they've still got a ways to go on their goal, but hopefully a lot of people will back it last-minute. They got off to such a strong start that I don't doubt it will happen. Actually, it's on track for just edging out a win. Kickstarter pledges usually follow an inverted bell curve: lots of excited pledges in the first few days, a long lull, then lots of panicked pledges in the last few days. We're hoping this Wii U news will help with the final push, and we'd appreciate any help in spreading the word! Even the character lookes pretty much the same. @Einherjar I think you're thinking of The Neverhood. I really hope they reach the goal. I used to have the Neverhood, but it got thrown away because it creeped everyone in my family out. (including me) Now I wish I could play it, and wish I had at least sold it! Copies sell for around $50! Guys, they are going to hit the goal. If you haven't ever done Kickstarter before, majority of the money comes at the very beginning and the very end. There is still time. I am confident this game will be made, so much so I have invested $250 in the kickstarter. @mystman12 If you want to play the NEVERHOOD, contact me on facebook. I can get you a copy and tell you how to get it to work on Windows 7. Also, I LOVE your name. @Einherjar That is the NEVERHOOD. This is the "spiritual successor" to that game. @VideoVader Exactly! SEIZE THE KLAY! Looks pretty interesting! A claymation/stopmotion point and klick! The main-character immediately reminded me of earthworm Jim. Guess what, it's from someone who worked on Earthworm Jim! Looks good, but it's point and click so no buy for me. Definitely looks interesting. I dig the claymation style. PLEASE PLEASE PLEASE OH MY GOD. @Henmii It's from the creator of Earthworm Jim. Yeah, Neverhood was the game i meant I sadly never played it, but i just love the visuals. Lets hope the best for this project. (voice of) Michael J Nelson FTW! Very excited to know Pencil Test is considering Wii U! I played the Neverhood far too much when I was a kid so a crowdfunded spiritual successor is awesome. The game pad or wiimote would be perfect for a point and click. Just to let everyone know, Pencil Test Studios has officially become a licensed Wii U developer (even without Armikrog). Pencil Test Studios, Inc.: "Just heard back from Nintendo (wow, that was fast!) Pencil Test Studios in now an officially licensed Nintendo Wii U developer! Lee Meyer, could you please update the article with this info? Thanks! point&click adventure, my favorite oldschool genre. looks great! i'm in for a wii u version. haha that character reminded me of earthworm jim. the second i read it, it all made sense. i wish them all the best of luck, and almost-guarantee my support as soon as they'd release it. i love point and click. wii had a few greats, the ds screen is just a bit too small but still a few really nice ones, but wii u has all you need. big touch screen AND wiimote support? count me in! @SKTTR As am I! But please be sure to drop by the Kickstarter page: there are only 5 days left, and we need all the help we can get for the final push! Thanks! @Shambo We'd appreciate a few buck's support in advance, too. This way we make sure the Kickstarter succeeds so we can get the Wii U port! The deadline is the morning of June 27. Much appreciated! @VideoVader i would like to if i could. i live in belgium, and have no credit card or anything alike, by choice. but, let's say it does happen -which i sincerely hope, after re-watching the video over and over-, will it be on e-shop only, or will it get a retail or even collector's edition (in europe)? @Shambo It will probably depend upon how much backing they get both by Nintendo and through the kickstarter, and since they've only just gotten the developers' license, they might not have done the math yet. I'll submit your question to the developers and post back here when I get an answer! And don't worry if you can't donate or pre-order right now. We'd still very much appreciate if you could please spread the word about Armikrog on Wii U (also PC/Mac/Linus) to other Nintendo fans who don't yet know. Many thanks! @DiSTANToblivion They are now a fully licensed Wii U developer. Someone who was in Nintendo pushed for them to be fastracked, and they were accepted in no time. Also the game WILL be on the Wii U if the goal reaches $950,000 ($50,000 more than the initial goal). @VideoVader I've shared a link on Facebook, hopefully it will help a little. Maybe Nintendo themselves could jump in and get console exclusivity (not including pc and stuff) for their money. Recently bought an Earthworm Jim action figure for my collection, loving it! @Shambo Thanks, man, I appreciate the help! Also, there are some new images on the Armikrog site about how the Wii U gamepad will be implemented! Could you please share these, too? Thanks! I really hope this game makes it! I'm a big fan of TenNapel's and I backed this game a couple weeks ago. I upped my pledge when I read this. Luckily the extra stuff you get for each tier is pretty cool. "After E3 we were contacted by Nintendo and we're talking to them about the possibility of releasing Armikrog on the Wii U. There's nothing concrete to report yet, but we're encouraged by their interest and we'd like to see it happen." Well thats nice to hear that Nintendo is out there actively courting indie developers, as they should. This title looks interesting. I don't think there has been a claymation video game... so kudos for the originality. I´m so backing this game! The Neverhood was one of the funniest games ever... and that soundtrack! They have 52 hours to go and only $80k (if $800k is true). There's a huge cross-section of gamers interested but for as little as pledging $15 for a Wii U digital download in return, I'm sure that these guys aren't anywhere near being beaten as suggested by earlier posters if the Wii U crowd get on-board. Mike and Ed have said that if they don't reach the stretch goal to 950k, they will open a PayPal account to fund the Wii U version! So if the project reaches its initial goal, the Wii U version is in the bag! Right now they are only about 75k shy of the 900k goal!!! However, this is the last day! If you haven't backed this project, please consider it now! If you have backed it, please consider increasing your pledge by as little as $5! The goal is within reach! We can't let this project fail! We can't!